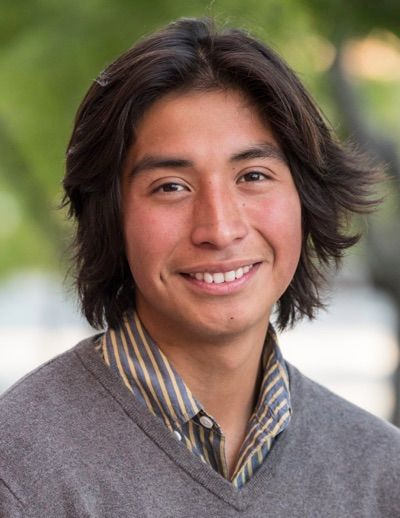 Eric Medina, a fourth year undergraduate at UC Santa Cruz double majoring in ecology and evolutionary biology and Latin American and Latino studies, has received a $15,000 public service scholarship to reinvigorate the garden at Oakes College. The Donald A. Strauss Public Service Scholarship Foundation presents scholarships to up to 15 California college students annually to support projects they will carry out during their junior or senior year. Medina, who grew up in Mendocino, says food and sustainable gardening are empowering. "Since high school, food has always been incredibly important to me," he said. "It was a major step in my life when I decided that I deserved food that made me feel good and capable." Reinvigorating the Oakes Garden will increase student access to healthy foods, which is linked to other aspects of wellbeing, he said. "How can one advocate for issues like gender equality or racial justice if they aren’t having their fundamental needs met?," asked Medina, who was a core member of the Kresge Garden Cooperative and now works for Food What? !, a youth empowerment and food justice program based on the UCSC Farm. Medina and other members of the garden want the renewed Oakes Garden to be a place where students can learn about sustainable gardening practices and be a hub for dialogue and action on issues related to food security for students on campus. Medina sees the garden as a space that will build community and empower students from diverse backgrounds. The Donald A. Strauss Public Service Scholarship Foundation was established in 1997 as a memorial to the late Don Strauss of Newport Beach, who demonstrated a strong, life-long commitment to public service and education. Since its inception, the foundation has awarded more than 280 scholarships.